You might remember this blanket that I made a little while ago? It’s Kit’s Arcade Blanket, and it’s based on the Larksfoot stitch. About 400 people registered to get this emailed out to them, and then my email program would not let me bulk email. So I’m putting it here right now, with apologies to the early birds that the email system (or I) did not work out! 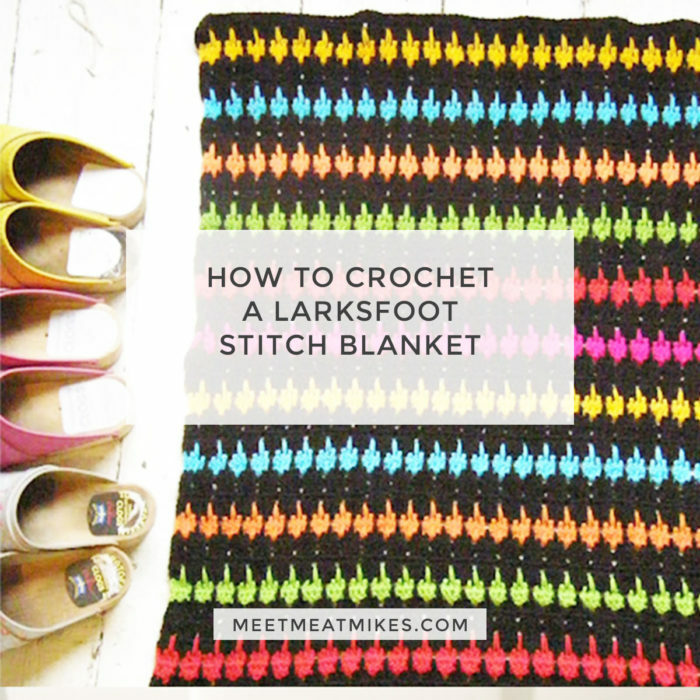 Anyhoo, I’m going to show you how to Larksfoot… and how to turn your Larksfoot into an Arcade block or blanket! Let’s go! I’m using Australian/UK terminology. If you’d like to try this and you are a US terminology crochet type, you will need to convert to US terms. Let’s start with Larksfoot. Larksfoot is the basis for the Arcade blanket. You need to know how to do this to make an Arcade blankie! Start crocheting now and I’ll tell you what to do for both! I’m using cream as my base colour. In the blanket above I used black. It’s important to choose one base colour to give your OTHER colours some contrast and impact. Foundation Chain :: I used a 4.5mm hook and regular DK yarn. Make a slip knot. For a blanket about 100cm wide (like mine!) you need to chain 120 stitches PLUS 2 extra chain stitches. If you are making something bigger or smaller, chain a multiple of 4 PLUS 2 extra chain stitches. Foundation Row :: Note I’m using my base colour of cream here. Still using the cream (or whatever YOUR base colour is) skip the stitch closest to the hook (the first stitch) and Double Crochet (or SC if you are a US crocheter!) once into every other stitch in your foundation chain. When you get to the end of your chain, turn your work around so you can work back across the row of stitches you just made. Row One : (see images below) Still using your base colour, chain ‘up’ three stitches to begin the next row. These three chain stitches are counted as the first treble in the row (even though they are not a treble, they are the same sort of height as a treble!) Now skip the first DC in the row below. *Treble once into the next three stitches. Chain one and skip the next stitch of the row below. * Repeat the pattern between the * and the * all the way along the row. Finish the row with one treble into each of the last four stitches. Turn your work to being crocheting back along to form a new row. Change Colour : Okay. (see photos below) We’re finished with our base colour. We don’t need it for a wee while. Tie it off securely and snip a nice long 30cm tail. We’ll weave that in later. Now you need to attach your new colour right where you tied off your old colour. I simply poke my hook through the last stitch I made and yank the fresh coloured yarn through to the front. I tie it in a firm knot (again leaving a long tail.) Yarn secured! Next I poke my hook back into that final stitch (where I just attached the new colour) and pull the new colour through to the front of my work, creating a loop on my hook in the process. Now I can start the next row! Let’s go! Row Three : (see images below) Now that we’ve secured our new yarn and we have a loop on our hook, we can begin our new row. Chain 3 (this counts as the first treble in this row), Treble once into the next stitch. Skip the next stitch. Chain One. Treble once into the next stitch. Treble once into the GAP which is TWO ROWS BELOW. You’ll need to loosen up your tension and let a bit of extra yarn out. I have made a fairly dodgy video to show you how to do it too : click here to watch that! Next, one treble into next stitch. Skip the next and chain one. *One treble into the next stitch. One (long!) treble into the gap two rows below. One treble into next stitch. Skip the next and chain one. * Repeat the pattern between the * and the * : or just follow my photos! The row ends with TWO trebles into the final TWO stitches. Turn your work around to crochet back the other way in the same colour. Row Four : (see photos below) Chain up three to being this row. We haven’t changed colours, you will note! Treble once into the next stitch. *Skip the next stitch and chain one. Treble once into the next three stitches. * Repeat the pattern between * and * or follow my photos! Finish the row with one treble into each of the last two stitches. Tie your yarn off firmly leaving a long tail, as before. Row Five : Back to base! Return to your base colour, attaching it as before. (See images below) Now that we’ve secured our base colour yarn and we have a loop on our hook, we can begin our new row. Chain 3 (this counts as the first treble in this row), Treble once into the next stitch. Skip the next stitch. Chain One. Treble once into the next stitch. Treble once into the GAP which is TWO ROWS BELOW. You’ll need to loosen up your tension and let a bit of extra yarn out, as before. Now, one treble into next stitch. Skip the next and chain one. *One treble into the next stitch. One (long!) treble into the gap two rows below. One treble into next stitch. Skip the next and chain one. * Repeat the pattern between the * and the * : or just follow my photos! The row ends with TWO trebles into the final TWO stitches. Turn your work around to crochet back the other way in the same colour. Row Six :: (See images below) We’re still working with the base colour. Don’t change colours. Chain up three. *Treble once into the next three stitches. Skip the next stitch and chain one. * Repeat the pattern between * and * completing the row with one treble into each of the final four stitches in the row. Turn your work as before. For Larksfoot (see first group of images below) we fasten off our yarn here and change colours. We then repeat Row Three To Row Six and keep alternating our base colour and our accent colours as before. Just follow the photos and repeat the pattern above over and over until your work is the size you like! Weave in your ends in front of the telly! For Arcade (see images below) we repeat this Row Six in our base yarn two more times (for a total of 3 ROW SIXES!) This makes a nice big block between our colours and creates a nicer contrast, I think. Then we switch to our accent colour and crochet exactly as we did in Row Three and Four (once more) in that. Then switch to our base colour and crochet Row Five again. Then (in the same colour) crochet Row Six THREE TIMES to make that big block of base colour. And so on, alternating the above : a big block (four rows in total!) of base colour : then two rows of accent colour! Make sense? Follow the pictures! Keep going until the blanket seems like the right size. Then weave in your ends nicely! sorry, it’s hard to see the stitches in black! I’m actually mixing up my Arcade with my Larksfoot for this blanket…. Just to be crazy! I hope this tute makes sense to you! I have been working on it for ages, so I hope it gets you Larksfooting or Arcading! Once you have the basic building blocks/structure, you just follow the previous rows. And the key to Arcade is those big blocks of space in a base colour, between the accent colours! Phew! Okay! Let me know how you go! Arcade-Foot. Or something. A mixture of BOTH! You know, while I've been larksfooting away, it occured to me that you could call your Larksfoot/arcade mix "Larcade" or "L'arcade" if you are feeling a bit posh! Yay Pip! Thankyou for posting this – I was one of the emailers and when I didn't get anything, was wondering if my email account had maybe eaten the pattern! So glad it's up here now…it's sure to keep me busy for my immenent hospital stay! YAY! Thanks so much for this great tutorial!!! You're a champ. THANK you! I can't wait to try this!!!! The picture tutorial is fantastic and I really love the color choices for the white/cream color blanket! 😀 Happy Saturday! 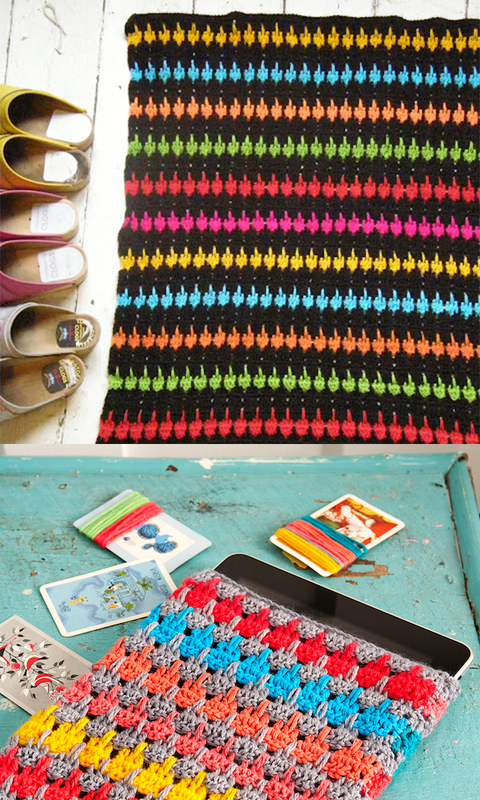 Fantastic Blanket or use something stronger and make a beautiful floor rug. You are so clever and should do lots nore crochet. It's such a wonderful inventive medium. I agree your next book should be all about crochet. Your Pic's and written explanations are wonderful! Thanks Pip for another exciting project. If you have time come and visit our website, we are two illustrators making screenprints and nice design! This is awesome. This will be my next project! Thank you for taking the time to put this all together…. Pip, I will never thank you enough for being able to teach me how to crochet!! I first learned to do your granny squares and now this! Your tutorials are always so easy to follow! I started my blanket and it already looks superb!! You know, I love this rug, and thanks heaps for posting such comprehensive instructions – but I have to say, I can't help seeing someone doing a "flip the bird" when I look at that larksfoot stitch. 🙂 There, I've said it now, but this tutorial was, for me, worth reading just to find out how you change colours! – I am going to try that right now because I suspect it might turn out better than my current method! So, thank you. Wowee! Thankyou Pip! This is great. You make your tips so easy to follow, and I love that you include little notes to keep in mind if we decide to be stubborn and do it slightly differently. I can't crochet yet, but this project will be the motivation to learn. It must have taken you a lot of work to put this together. Thank you for giving it so much thought. 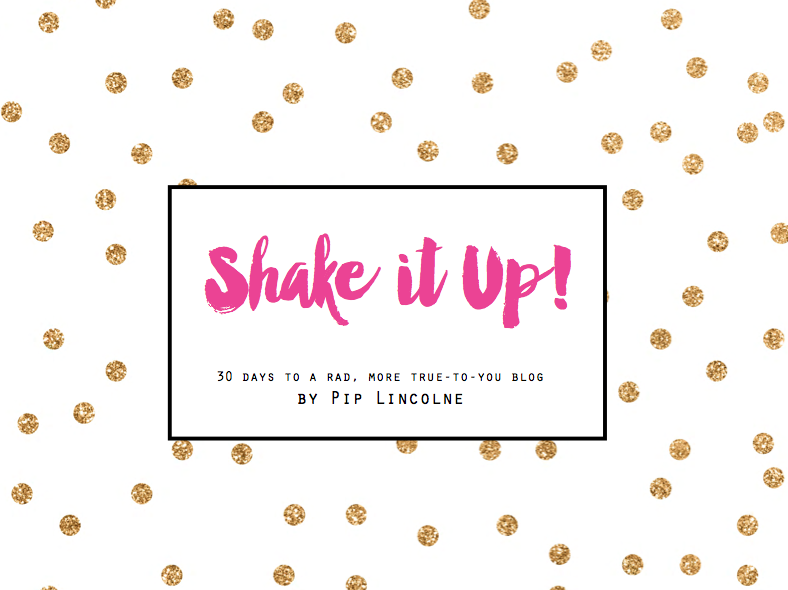 Looks awesome and makes total sense – I can't wait to try it!! Thank you so much for the great tutorial. I'm so glad you showed several rows because you are so good at picking out colors. That will help me a lot. I'm going to start hooking right away. OMG I want those shoes! Thankyou! Both those versions are gorgeous and look so utterly different just because of the difference in the background colour 😀 I will be making a space invaders version for my biggest boy soon! Thankyou! I'll be trying this. Great tutorial and I love all the shoes too. It is looks great and love all the shoes too. Wel done Pip, you are so clever & kind. I am afraid I am maybe not clever enough to make this but I am still gonna try! On another note- CUTE SHOES!!!! Those ones in the first couple of pics are lovely, please share where they are from…. Thanks for the awesome tutorial Pip! I've only just taught myself how to crochet in rows so i'm definitely going to give the larks foot and arcade a go- it's such a lovely pattern! I was also just wondering what brand of yarn you like to use? All of the colours in your crochet projects are just beautiful.